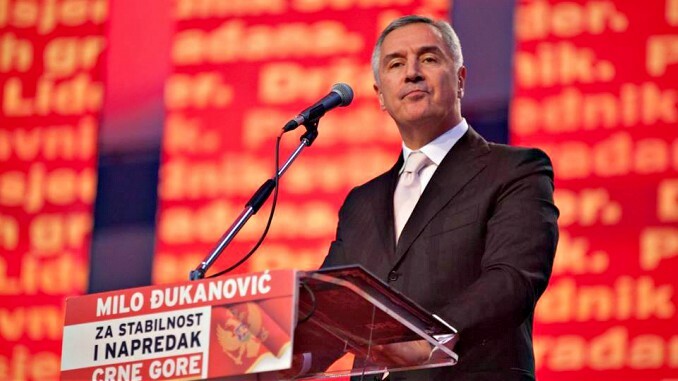 Podgorica, Montenegro (Tirana Echo) – Pro western Milo Djukanovic has won Montenegro’s presidential race after previously having served six terms as prime minister and a term as president. The state election commission confirmed provisional results from the vote on Sunday with the leader of ruling Democratic Party of Socialists (DPS) winning the race by 54% of the national vote in the small Balkan country. The country had to choose between six candidates with Mladen Bojanic supported by the pro Russian opposition parties coming second in the poll with 34% of the vote. The vote is a confirmation of slim support for the ‘eternal’ leader of Montenegro who led the country out of a union with Serbia in 2006 and was key to the country joining NATO last year, despite fierce opposition from pro Serbian and pro Russian political groups. Pro western Milo Djukanovic, 54, has run Montenegro for almost three decades and seeks to push ahead with a pro EU and pro NATO political agenda. He benefits largely from the support of minority parties, notably the Albanian minority in the country. Despite opposition accusations of ties with organized crime and corruption, Djukanovic enjoys widespread support in the West, notably because of the stability and pro European agenda he has provided for Montenegro.